Some of the conflicts in the record were documented this August in a report from the GSA inspector general, but Murphy has maintained that her April 2018 testimony to Congress about GSA’s plan to rebuild the HQ downtown—released in February—was accurate and that the decision was based on cost considerations. 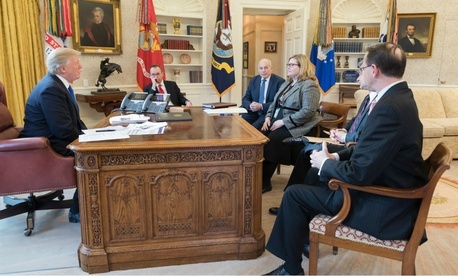 The IG has now provided Cummings with additional documents, and The New York Times, using the Freedom of Information Act, on Wednesday published for the first time a Jan. 24, 2018, official White House photo showing Murphy and FBI Director Christopher Wray in the Oval Office. The documents contain references to “the project the president wants” and show that top GSA officials promised to “hold our ground” on this proposal “per the president’s instructions” to not sell the downtown property to a commercial developer. Murphy was also reported to have asked the IG to remove references to her April 2018 testimony from her August 2018 report, which IG Carol Ochoa declined to do. Further emails from Mathews asked the White House to put something in writing on a plan to demolish the J. Edgar Hoover building (built in 1974) and construct a new headquarters on the same site, saying, “Ideally I think it would first recap the oval meeting with what POTUS directed everyone to do then ask Emily (GSA) to execute POTUS’s orders,” according to Cummings’ letter. The 2017 decision to cancel the well-advanced solicitation of construction firms for bids on building a new campus in one of three sites in suburban Maryland and Virginia irked House members and senators in the Washington area. The current plan to rebuild at the same Pennsylvania Avenue facility “could cost hundreds of millions of dollars more than the long-term relocation plan, but it would accommodate 2,306 fewer employees,” Cummings protested. As previously testified by GSA and the FBI, the leadership team at the FBI made the decision to keep its headquarters at the current Pennsylvania Avenue location. A number of emails referenced in today’s congressional letter are taken out of context and refer to the project's funding approach, not the location decision. Suggestions that those emails indicate presidential involvement in the location decision are inaccurate. GSA stands by its testimony and the cost analysis proposed in the joint revised plan submitted to Congress in February. The lawmakers asked Murphy to provide a timetable and all relevant documents by Nov. 1. This story has been updated with a statement from GSA.